As I don't celebrate Halloween, I thought I'd share some of my favorite fall things to do. I went apple picking for the first time this year, it's my new favorite fall activity. 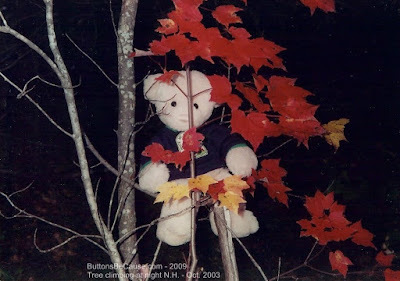 Trips to New Hampshire in the fall for Leaf Peeping. On this particular trip we took in the color on the highways and byways, by the time we got back to my grandparents it was getting dark. But I still needed a closer look at those beautiful red leaves. What better way than to climb a tree? I like to play in the leaves after dad rakes them. My mom always decorates our house for fall with fall floral arrangements, leaves, pumpkins, smelly candles (did I type that out loud? )Partly why I love it when she gets the fall decorations out is I get to some of my favorites. 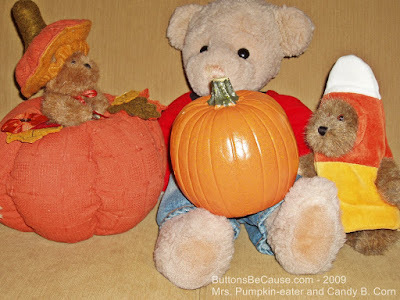 This is Buster, me, one of my favorite pumpkins and my friend Candy B. Corn. Buster is wearing his Chicago Bears NFL jersey. Cocoa and I are going to have to get our Chicago Bears sweatshirts on soon, it's turning colder, the wind is howling outside right now. We love to watch football in the fall. Heehee! That's Mrs. Pumpkin-Eater, she lives in the pumpkin shell. She pops up every year to surprise me. Candy B. Corn told us he'd looked everywhere around the house, but couldn't find any candy corn. Candy B. Corn asked Buster "where's the candy corn? Buster explained that mom didn't buy any this year. Mom ran across a recipe for Home-made Candy Corn and was thinking about making some. We all are a bit disappointed, because thinking about it is all she managed. We bears love candy corn. I think Scruffy forgot that we don't dress-up. He tried to tell me he wasn't dressing up. He had been nose shopping, for a nose to replace my worn nose. You'll lucky to having trees. What a nice nose, but your current nose isn't that bad. Buttons! I just loved your blog post on fall things! I love candy corn too, so if your Mom thinks any further on making some and it appears at your house, give me a call right away and UP and I will be there pronto! Cute nose, I almost didn't recognize you. Tell Candy B. Corn that she is just the cutest little thing!